Well, Capstone is over and I have now completed the first year of my full time MBA. We had to do a business case competition and I have to admit it was pretty funny. We had to do a some recommendations for a clothing retailer that isn't sure how to proceed in the face of increased pressure on margins and competition. We went to the store, two of them in fact, and spent about two hours in one store and its area and about half an hour at the other. We spoke to the staff and the customers about the store. We bought 5 dollar Starbucks cards and gave them out. We gave one to the staff at the Kits store and then one to an older lady who bought a bunch of stuff and two 15 year old girls who bounced out of the store but have been many times with their moms. The store was pretty interesting. We thought from the description given that it might have been highly fashionable. But it the end, it was fairly middle road conservative work wear. The Starbucks baristas we spoke to about it said they'd only go for something for church of a wedding. The young girls didn't find anything that they felt was for them. They said it would be a 2 on the "like me" scale to 5. Their marketing was not the greatest. Great location but subdued signage. So the company hasn't really shown me at this point that it has the muscle in marketing to go to a new audience outside of the middle aged girl. They like the clothes, as they do shop there... and each store had good food traffic.... so they have pretty good revenue. So they have a great repeat customer who is 35-55. They have some money and a job so they spend 5 days each week in their work type clothes. So you can't move down in age appeal. We felt you should make more of your lines of clothes, because people like your clothes and that's why they go there. Sell more of your own clothes, which you make in North America. Overseas might have been good in 2005 but shipping prices are up 100 percent in last 8 months. Starting to go there is going to take time and scale you don't have. Your main customer is a big group and you can just focus on them. The youngest of that group is only 35, she's going to work until 55 or even 60 - and people are working longer so by then, maybe even 70 and need your clothes. That's 25 years! Unfortunately, this didn't really seem to get through. I guess sometimes you know something so well and so surely that you just can't believe somebody won't see it. They will only see that we don't have any girls in our group and that we spoke to 15 year old girls - who aren't your customers. Oh well, I'm off to Kelowna tomorrow for a four days. Staying at the Lake Okanagan Resort, which is out in the middle of nowhere. Going to visit wineries, play some golf and relax. I guess I won't be blogging for the time that I'm there because I need some time away from a computer screen. This is funny.... the Cathay Pacific case centers around the changes made to the Inflight Services Department in 1997 under the leadership of Peter Buecking. Well... he's actually here and just finished talking to us. Best part was our Capstone facilitator asked who would work for Peter? Few people's hands went up... and then he introduced Peter, who had been hiding in the wings until that point. Saying you'd never work for someone who when you don't think he's going to find out only to realize he's standing in front of you: priceless. Although it's about 22 degrees and sunny here today (note the weather widget in the right side of my blog) I'm sitting two floors below street level at the UBC Robson Square campus for the Capstone Program. Basically, there are about 70 people in our class taking part. The Capstone is designed to bring us back together and apply what we've learned in the program. This morning has been a discussion of the Cathay Pacific (or as I say, Cathay Specific). This afternoon we are finishing that up and getting briefed by CEO's on real life problems their business are facing. We are in groups of 5 and have until Monday morning to come back with solutions. Basically, it's going to be a total barbeque session. I might even wear my grilling outfit - apron and tongs all the way. I have to admit - I don't have much juice left though. I felt sick from exhaustion this morning on my way down here and I can't really stomach much food. Either way, it's going to be sweet to take these skills for a ride and it will make Kelowna allt he more interesting next week. David Cook won American Idol last night. Since this happened, people have asked me about what my thoughts are, so here they are. David Cook is a total idiot and a douche. That said, he deserved to win. Not because his brother, terminally ill with cancer, was there but because he simply outperformed. Archuleta is and will be a major recording star. I think he was a bit too young for the show. Winning Idol is hard. You have to endure the scrutiny and media attention. He was only 17 and I blogged previously about his inexperience in this sort of situation. But it also goes to show some of the problems with the show. Things are getting boring. Let's see what next year brings before we make any harsh judgment. Agreed? MTV has a good thing going on with their website and the availability of their shows. You can go to their website and watch pretty much every show they air. You can save episodes and save a whole playlist of shows much like you would if you were had TIVO or another DVR on your cablebox. I have watched shows on their site before but I have started to use it more often now that my term is almost over at school and have a few more minutes of spare time here and there. What is most interesting about is that they only show a 3o second spot every 5 minutes or even more so you see less commercial interruption. Good move on their part as I actually find myself not being annoyed by the ads.... so seems like they have gotten something right. take care. One exam down, one more to go. This is the last week of the first part of the full time MBA program. I am going to Seattle on Tuesday to meet the people in the head office at Laplink. I am in the process of finalizing my internship details with them for the summer. I am really looking forward it. It's going to be a great summer and I'm really looking forward to getting back into the workforce so that I can see how much my skills have improved being in the program. Wednesday afternoon, I have an exam in Business Strategy and then on Thursday afternoon I have my last exam in Environmental Marketing, which was a great course and the first time I took something over in the sustainability side of the program. Friday I have a big group project due for Relationship Marketing and then Saturday is the start of a three day Capstone program. The Capstone was put together to allow us to apply our skills in integrated problem solving. On Saturday morning we have a case memo due and a discussion about it. Then we get briefed on a real world business problem and have 24 hours to come up with a solution to present. Monday is going to be discussion panels and then we're finished. Next week I'm planning a trip to Kelowna to hit a few wineries through Saturday and then I'm back in town to start up my internship on Monday. Going to be whirlwind week! McDonald's Canada has a new micro-site dedicated to their new Angus burgers. Unfortunately, the broadcast TV versions are not on Youtube yet so you have to go to the mini-site to see them. The bloopers are pretty funny and they have gone to great lengths to give them a cinematic look and feel. CW11, one of the only channels I get on TV is showing old episodes of Seinfeld each night from ten to eleven, the only time I might ever watch tv. It is the episode where Jerry races his friend from high school, everyone gets labeled an communist and elene gets Ned the commy banned from hop sings after she "named names". My favorite line has to be Kramer, turning over to communism, while being the Macy's santa. This kid says he wants a truck or something and Kramer tells him the companies are getting huge profit and reducing the total number of toys. So funny and true. Economics can be really interesting when you explain them in relation to simple situations. The final scene is the race on the street where jerry wins again, set to the theme of Superman. Jerry says "maybe I will Lois... maybe I will...". I was talking to a friend the other day. He told he me that he saw the movie "Forgetting Sarah Marshall" the other day and it was terrible. He told me he was really upset about how bad it was. I said that it happens sometimes, they don't make movies like they used to. "Forgetting Sarah Marshall" is produced by Jud Apatow, who did "40 Year Old Virgin" and "Superbad", both of which are amazing movies. It was written by Jason Segel, who was the tall friend who sweet talks the sister in "Knocked Up" and was on "How I Met Your Mother". The problem is that the movie was terrible. It was filled with the same old jokes they always do except none of them are funny. Well, only a few of them are. The real kicker, he said, was that he tried to download the movie previously on BitTorrent, which he tells me is a popular file sharing program. Because he was feeling guilty about doing that, he ended up downloading The Bachelor instead. He ended up going to the theater and paid for two tickets to the movie. It cost him about $20. His date bought him a drink and popcorn for $1o. This means they got $15 per person. He and his date sat through the movie totally unimpressed. Waste of time. He feels he should have just downloaded it off BitTorrent because they shouldn't be allowed to dupe us into going out to see that garbage. It is punishment for making bad movies to have your goods pirated. Perhaps the balance of power has shifted to the consumer and it should continue until the previous wrongs have been paid for. I suggested they just put out movies like Ironman every weekend. Enough with the fluff like Maid of Honor or 27 Dresses. Those movies are never any good anyway and at best, worth the price of admission. Certainly not the drinks and everything else. I have been writing a paper for Environmental Marketing about organic food pricing strategies. I decided to choose this topic because I know someone who loves paying more for things at Whole Foods. I wanted to see exactly how organic foods are priced when compared to non-organic versions. I also wanted to see how much more Whole Foods charges for its organic products. I priced out a few different products but I think the B.C. gala apples are a great example of how things are priced because I was able to find both organic and non organic versions. At Whole Foods, they were $2.49. At Safeway, the organic versions were $1.79 and the non organic version was only $1.49. Whole Foods is charging a full dollar more a pound for the organic part of the product and then 70 cents more because it is Whole Foods. I contacted Whole Foods and they said "Whole Foods Market’s prices are equal to or better than the average supermarket’s for products of similar quality". So I then looked at profit margins and found out traditional grocery stores earn a profit margin of about 1%, yet our friends at Whole Foods earn close to 3%. Now I wasn't able to do any type of full on consumer behavior study but I would bet that Whole Foods is able to get away with this because the people who walk in there are simply willing to pay more. Perhaps they don't know to price organic foods. We have been buying non-organic product for years and we might know what somethings costs when it's non-organic. Once the organic label is placed in the banana, how much more should it be? I think that Whole Foods customers don't even care. Whole Foods owns them the second they walk in the door. They situate their stores where people who have money like to shop. I used to work near one in Toronto (notice I say work and not live) and it was in Yorkville, where most of the cars are at least a BMW. Imagine that, you own a business and your customers don't even care what the price of something is. That's gold right there. I haven't posted too much personal stuff lately so here is a quick update live, from the Starbucks at Jervis and Robson. They generate A LOT of waste. These people are going through dishes and milk cartons like crazy and I'm not entirely sure things are getting recycled because I notice that waste just goes into this big grey garbage with a clear bag in it. Making double-non-fat-lattes-with-such-and-such is a messy ordeal. 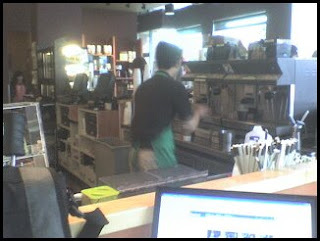 To the customer, it may look clean in here but behind that counter is war zone. However they do spend their free time cleaning it... which brings me to my next point. The kids work hard. From a distance it might seem like an easy job... making coffee but I am noticing that it is so much more. They need to aware of how long things have been sitting around for and there are all kinds of timers and temperature gauges to read. It's like a airplane cockpit back there. For the first time in the last hour there isn't a line of people ordering things so they are cleaning and stacking everything. My friend from Ottawa is in town and we're going out tonight for dinner. Last night, we met up with some other friends and went for a few drinks. Because university just ended, the bars were packed with students going nuts. Life has been really busy lately so I have to admit I haven't done anything fun in my personal life worth talking about. School is busy, as always and then my spare time has been reading and researching various topics. I have upwards of 4 books on the go right now and I'm really enjoying them. I am reading the Art of War, a book on mobile technology for the second time in one week, a book great book on networking and a book on sales. On the table next to me right now is a case on Home Depot. I took a dining etiquette class the other night. It was super fun but I was totally wiped because I was up at 6am and downtown for about 7am to attend the Global Business Risk Management Forum I helped promote for a local company. Totally interesting stuff... except taxation. The guy from KPMG was super interesting but I am just not into the subject of taxation. To each his, or her, own though. I guess I am going to put those dining skills to use tonight at Lift. I am really looking forward to the spring. I am planning a trip to Kelowna for a few days after this term ends because I need a few days where I don't think about anything but relaxation. Most of my days start at about 7 and finish at about midnight with the majority of that time being spent sucking up information. I learned recently that if you eat gold, you will be gold. This means that if you focus on ingesting the best info on subjects, then you truly learn valuable information really quickly and you start to see patterns in effective thinking and presentation. I have so many projects going on this month that I can't even find time to organize group meetings. I have one on Saturday morning, then I have to research organic food pricing for a paper I am doing (who writes papers in mba classes anyway) and then on Sunday I have another group meeting all afternoon. Then, on Monday, it's back to the grind, lather, rinse and repeat until about May 26th. Our final weekend is going to be the Capstone program, which I am totally looking forward to. I feel this program has really helped me lift my game and I am looking forward to show what I have learned. The problem is that it starts the Saturday morning after our exam week. We have to hand in an individual case write up. Saturday afternoon, we are briefed on a project that we present answers to on Sunday. Monday is going to be panel discussions.... then we're done. Good news though - it is worth 1.5 credits so I can take one less course in the fall. Anyways, that's it for now. Take care. Sorry if there are any typos or anything, it's been a long week.